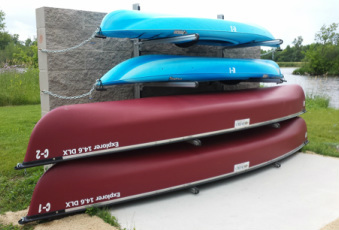 The City of Omro Parks and Recreation department, in conjuction with Federal and DNR grant funding, is pleased to offer ﻿FREE﻿ canoe and kayak use to our community from Stearn's Park. The canoes and kayaks are to be used by launching at Stearn's Park into the Fox River. DO NOT transport to any other location for use. You may contact Omro City Hall at (920) 685-7000 to begin the reservation and check out process. City Hall is located at 205 S. Webster Avenue and is open from 8:00 am - 4:30 pm Monday - Friday. Reserved weekend users must complete the check out process prior to closing on Friday and return the items by 9:00 am Monday morning. Please read the Park Canoe / Kayak Use Signage form and the Voluntary Waiver and Use / Rental Form to the right for more details. This seven acre site is Omro's most developed parkland, and is intensively used by both local residents and visitors to the community. This jewel of a park features: an island atmosphere for fishing, a playground, shelter house, large pavilion, pay shower facilities, and overnight boat mooring sites with water and electric utilities. Both the shelter house and the large American Bank Pavilion are available for rent. Located at 1241 Kiwanis Street, Miller Park is home to the Omro Family Aquatic Center, Kiwanis Shelter, and Kiwanis Pavilion, all of which are available for rent by the community. The park provides excellent fishing opportunities, a boat launch ramp, watercraft mooring, and docking facilities in the seawall lined Miller Bay. In addition, the park provides playgrounds, restroom facilities, and beautifully landscaped parklands and open green spaces, all along the shores of the Fox River. This park, located on the west end of Main Street along the Fox River, provides a playground of swings and spring fire engine, small shelter house, gazebo, picnic area, horseshoe pits, and benches along the seawall for relaxation or fishing. The parking lot is large and provides access to the boat launch ramps in the park. Water and sewer restroom facilities are available. This twelve acre park is located between River Drive and the north bank of the Fox River. It has a small playground area, a picnic area, soccer field and goals, fishing piers and docks, and a boat launch ramp. There are no restrooms in this park with water and sewer utilities, although a portable sanitation house is provided. Hillside Park is approximately three acres and is located next to the Wastewater Treatment Plant on Hawthorne Drive. The site is open space and there are currently no plans for development. At nearly three acres, recently named Lincoln Park is a great open green space for that afternoon football game with your friends. It is located on Lincoln Street, north of the mobile home park and east of the Omro Family Aquatic Center. This small park located on the north bank of the Fox River adjacent to the foot bridge, provides a sitting area, fishing opportunities, and a beautiful vista of the river. Looking to rent a pavilion or shelter in one of our parks? Click on the Park Request Form PDF below for prices and a detailed description of each facility available for rent. 205 S. Webster Avenue or (920) 685-7000. This 50' x 112' open sided American Bank pavilion is available for rental upon the beautiful island setting of Scott Park. The facility has twenty-one picnic tables to accomodate your guests of up to 900 capacity. The rental fee also includes use of a refrigerator and chest freezer for your event. This pavilion is specially wired to meet the electricity demands for multiple slow cookers and heating appliances, as well as suitable power supply to support live bands with accessory sound and lighting equipment. A stage system is available for additional rental fees. The newly constructed warming hut for the winter season ice rink, is also available for rental by your organization. It makes an excellent site for hosting a fundraiser such as a brat fry, cookie sales, or other retail sale items, as this site has heavy traffic volume from Hwy 21 with the easy drive up and parking available along both sides of the highway. This park is a 4.5 acre recreational facility located at 815 E. Main Street. The ball park is the home field of the Omro Athletic Association which sponsors many community tournaments. Support facilities include an open shelter house, concession building, electronic scoreboard, bleachers, parking lot, and restroom facilities. The basketball court is located on the southwest corner of East Larrabee Street and South Webster Avenue, across from the Omro Area Community Center and Webster Manor elderly housing facility. The park is paved and lined for the four basketball hoops available on the nearly 1/2 acre site. A drinking fountain provides a fresh water supply to keep the athletes well hydrated on those hot summer days. A handicapped accessible portable sanitation house is provided. The entire court is surrounded by a chain link fence to provide added safety benefits. During the winter, the public works department uses this court for storage of large snow piles. This two acre park, located on Tower Lane at the highest point in the city, is well utilized as the community sledding hill. Bring your sled, hot cocoa, and your courage to take full advantage of this recreational site. There are no restroom or picnic facilities available at this location. This small sitting area, about a tenth-acre in size, is located immediately east of the south approach to the Hwy 21 / 116 bridge across the Fox River. Facilities include benches along the sidewalk and river's edge, and an artesian well in the central portion of the site provides fresh water supply to area residents. This newly developed park area is located at the south end of the walk bridge and behind the first block of the East Main Street businesses. This park offers a peaceful place to relax or enjoy a picnic lunch. There are three decorative benches and a picnic table available for public use among the trees and landscaping. Municipal parking is available nearby and the park is handicapped accessible with paved sidewalks. Access to the park is available off the west and east sides, with the east side proudly displaying a large wall mural of a steamboat traveling the waters of the Fox River which was hand painted by local artists.